Armenian site Tert.am published article about “Armenian victims of Baku riots 1990” and presented as factual evidences photos of Azerbaijani victims murdered by Armenian military men and gangs, as well as photos of victims of Balcan war and victims of ethnic clashes between Greek and Turkish population (1955). The article states that 300 Armenians were killed in Baku in1990. This is false information. The truth is the fact that the total number of January riots victims in Baku is 90 (Black garden: Armenia and Azerbaijan through peace and war, Thomas de Waal, 2003, p90). The false information of the article was “proved” by the photos, but the validity check showed that none of these photos presents “Armenian victims of Baku riots 1990”. Photo n1: Tert.am presents the photos of sisters Aysel and Gyulmira Mehdiyeva brutally murdered by Armenian military persons and gangs in February 1992. 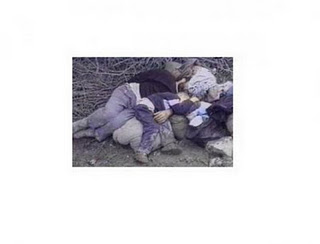 The Author asserts that those two children are …“Armenian victims of Baku riots 1990”. The other Armenian site asbarez.com has published the same photos to affirm that these two girls are “Armenian victims of Sumgait riots”. Obviously, M. Grigoryan used photos from this site for her forgery. Mehdiyeva Aysel Murad kizi was born in 1988, Mehdiyeva Gyulmira Murad kizi was born in 1989 in Khojaly. 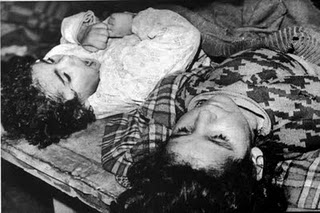 Both children were shot to death near the village of Nakhichevanik where Azerbaijani civilians tried to flee after the capture of Khojaly by Armenian bandits (February 26, 1992). To that time, Aysel was 4 years old. Her sister Gyulmira was just 3. "- Murad (Nana's husband, and Aysel and Gyulmira’s father), returned from his military observation post, pulled us out of the basement. I did not even go to the house. Children and I ran barefoot in the woods. My father-in-law’s Shafa took Aysel, and I carried a five-month son Arzu. Our group consisted of more than one hundred fifty people. Valleys, hills were full of dead bodies. Early in the morning of 26 February we crossed the motorway in vicinity of Nakhichevanik. Only few people from our group survived. The armored vehicle came and blocked the way. Murad shouted, "Lie down!" I pressed Arzu to my chest and covered the child with my body by making sure that bullet will heat me, not him. Armed Armenians came down from armored vehicle and began firing at us. I pressed Arzu to my chest and crawled to Murad: if one should die – one should die together. Murad was killed. At last moment he tried to reach out to me. He wanted to say something. But he could not. Shafa and Aysel were killed too. Only I, my sister Rose, my five-month son Arzu, country woman Shahnaz survived from the group of one hundred and fifty people. Armenians took us as captives to Askeran. Two days later we were released. Although a friend of Murad - Elman, took my daughter Gyulmira to his arms to save her, Armenians killed them both.... "
That night, vandals killed Aysel and Gyulmira, their father named Murad, their grandfather Shafa Mehdiyev. Aysel was found later along with her grandfather Shafa, both dead - grandfather was holding his granddaughter. The body of another sister Gyulmira was found in Ketiks forest, near to Nakhichevanik by the Azerbaijani journalist Chingiz Mustafayev. The whole country saw the footage of Chingiz holding bodies of two young girls. One of them was Gyulmira Murad kizi (Murad's daughter) Mehdiyeva. It is still not known who was the other girl... no one was able to identify her, since the Armenian fascists beheaded the child, gouged out her eyes and killed her parents and other relatives. Khojaly survivors named her “Nishane of Khojaly” (Sign of Khojaly). Gyulmira Mehdiyeva is buried in the Alley of Martyrs in Baku, near the tomb of Nishane of Khojaly. All these years, Gyulmira`s mother - Nana brings fresh carnations to the graves of little girls buried next to each other. Armenian media claims that this photo presents "victims of the Baku pogroms in 1990". 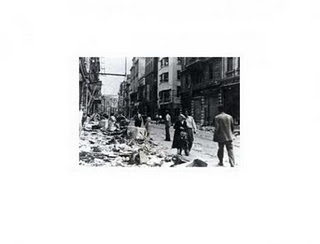 In fact, this photo has no relation either to Armenians, or Baku. 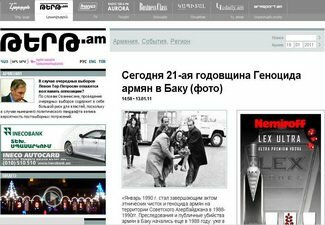 Armenian media presents the victims of the Balkan war as "victims of Baku pogroms in 1990". The original photo was made in the former Yugoslav republic in early 1990s. The photo shows massacred farmers in stained dirty galoshes, in a rural environment, which certainly does not belong to the capital of Azerbaijan, Baku. Hanged by Armenian military in Karabakh, Azerbaijani soldier is presented as "Armenian victim of Baku riots.” The fact that the victim is in military uniform proves that the photo has no relation to Armenian civilian residents of Baku. Armenian web site asbarez.com issued the material "in memory of the Black January and" genocide "of Armenians in Baku". Asbarez presented the photo of young Russian girl Vera Bessantina as "an Armenian, who was murdered at home during the genocide" in Baku. In fact, Vera Bessantina and other victims on this photo died on January 20, 1990 when Soviet Army invaded Baku and was indiscriminately shooting at everyone on the streets, at windows , on balconies, causing death of innocent children, women, and elderly in their own homes. 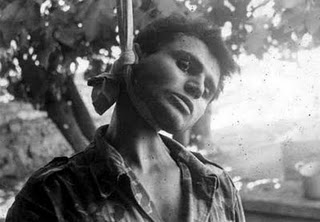 The above-discussed photos are obvious examples of how Armenian propaganda machine creates allegations and forgeries to present Azerbaijanis to the world community as blood-thirsty and barbaric people and form the idea that for this reason, it is impossible for Armenians to co-exist with Azerbaijanis and therefore Karabakh´s secession is necessary.